Not every title of an exhibition is self-explanatory. Sometimes it just increases the confusion. Constructed Culture Sounds Like Conculture is a group show at Ellis King in Dublin that has been put together by the swiss curator Samuel Leuenberger. Along the individual fantasy-scapes and narratives constructed by the artists Darren Bader, Mia Marfurt, Adrien Missika, Lydia Ourahmane and Tabor Robak, the show discusses the value of cultural constructions creating realities, responsibilities, images, perception-patterns and emotions attached to these realities. The result is a beautiful exhibition with a subject that is so complex and far-reaching, that I asked Samuel to explain the concept of Constructed Culture a bit further. Samuel has a keen sense of aesthetic compositions and challenges. 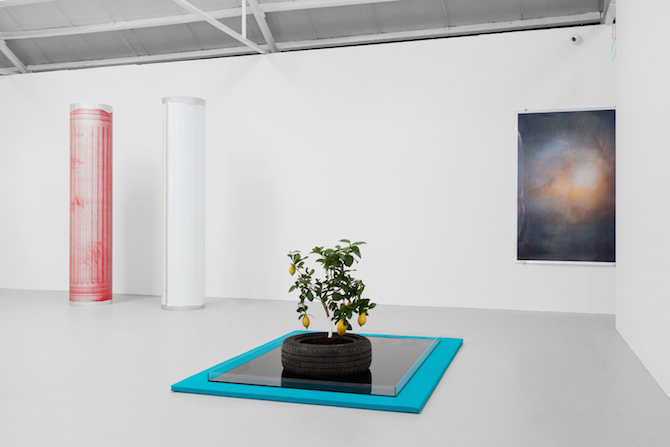 Having previously co-curated exhibitions like the live work show "14 Rooms" (2014) in Basel or the current painting show „Six Possibilities in Painting (Int)“ at Galerie Bernhard in Zurich, he experimented with both, the presentation of various artistic media and the negotioation of different subjects. 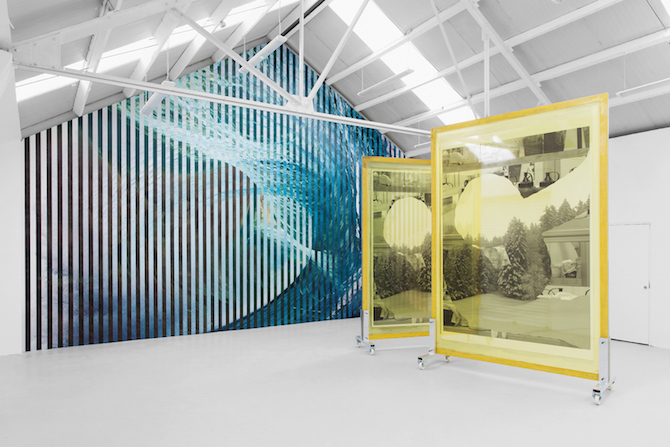 With SALTS, his own project space in Birsfelden, just outside Basel, that started as dinner club and art salon, Samuel created a space for curatorial experiments and the development of ideas. Today he runs SALTS together with associate curator Elise Lammer, organising exhibitions and inviting others to work with them. 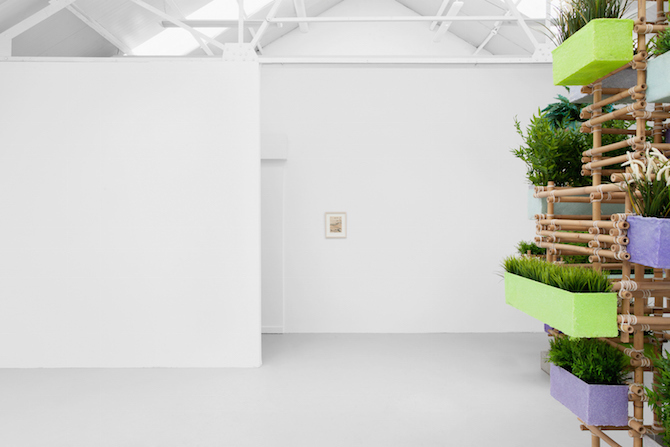 Anna-Lena Werner: Samuel, you curated the group show “Constructed Culture Sounds Like Conculture” at Ellis King in Dublin. Could you clarify the title? 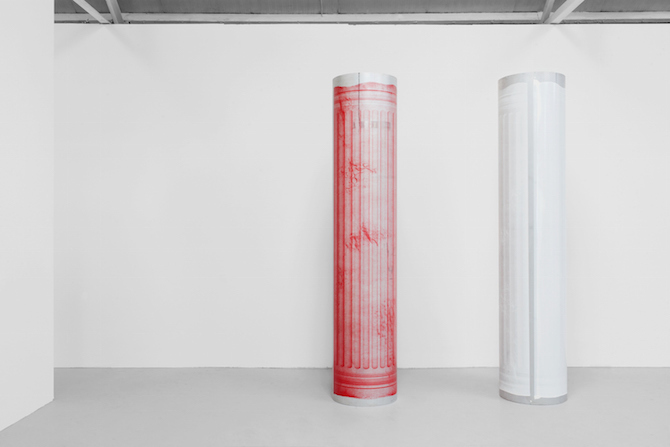 Samuel Leuenberger: The title stems from ongoing discussions within our society about cultural construction, which is something else than what the title says it is. Cultural construction is a social geographical construct where we in society define our surroundings, giving it meaning and form. Constructed culture is an obvious fake world, a fantasy construct - and it is what we enter through the artist’s vision, a personal experience, that is translated into their own language. The compelling moment is found in that the works presented here in the show, are as real as our daily experiences - only the context differs in the gallery. We are meant to let go of our constraint to read objects with the parameters of reason and rather dive into something new, albeit its otherworldly realness. Anna-Lena: What initiated your idea to make an exhibition about constructed cultures? Samuel: We read in the media about the furious speed, disconnecting us more and more from ourselves; about how our experiences of a real friendship, a conversation or an experience in daily life are defined, versus what technological advances offer us to overwrite these old precepts of how we define a thing or an emotion as true. The preset of this exhibition was great, since we started with something obviously constructed that offers to connect on an emotional level to the audience. 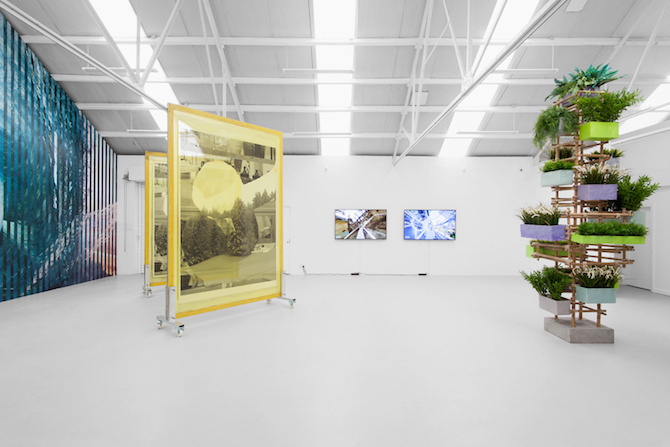 Anna-Lena: You invited the artists Darren Bader, Mia Marfurt, Adrien Missika, Lydia Ourahmane and Tabor Robak to exhibit works embodying their individual or fictional narrative worlds. Considering that all the works are together in one space, couldn’t this have gone totally wrong, too? Samuel: Yes it could have, since these artists share little in common; that is why we had to go straight to the cerebral part of their being, where vision and fantasy translates into a string of narrative and figurative images and concepts. 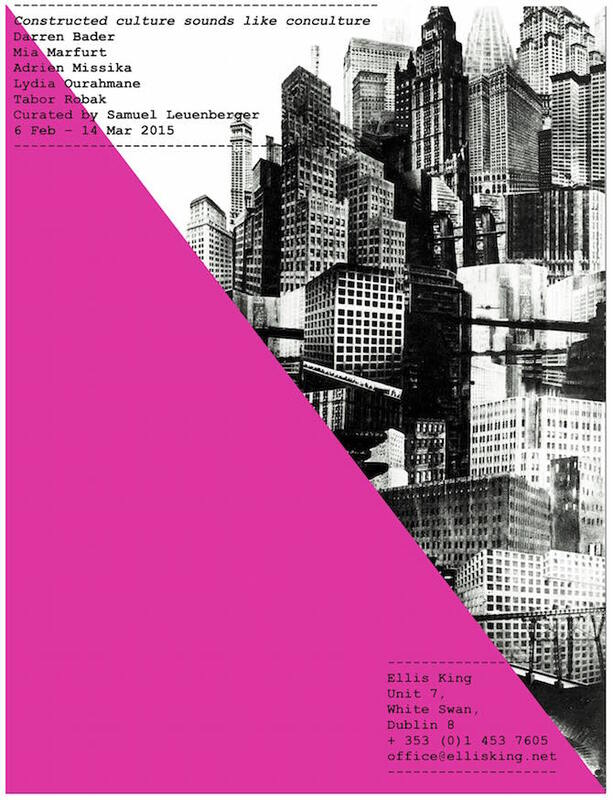 Anna-Lena: The show presents strategies of adaption, performativity and construction. Would you locate these as counterparts to concepts of truth and reality? Samuel: I wouldn’t, at least not in the context of the arts. It’s all real if you believe it to be true. 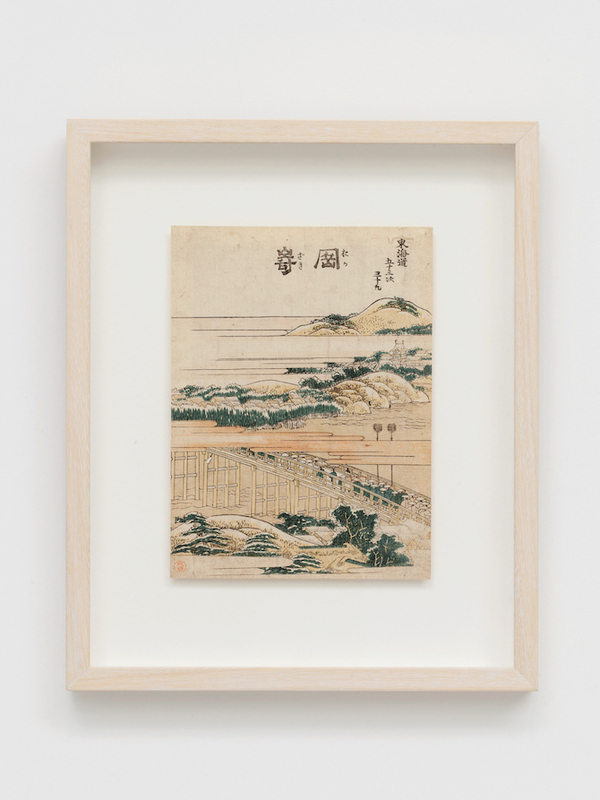 Anna-Lena: Darren Bader exhibits a 19th Century woodblock print that he did not create, but that he bought the authorship for. Mia Marfurt repeats copy-paste processes with different media and negotiates the plagiarism of our current culture. Do you think that these works question and eventually sabotage the notion of a possible individual narrative entirely? Samuel: Quite the opposite, look at the wide range of works and how widely unique they all are. They are all telling their own stories with their own palette of signifiers. Mia Marfurt’s images are actually based on images she sources and makes. It is her serial reproduction that seduces the mind to question a singular authorship. As with Darren Bader, his discussion around the topics of re-appropriating objects and re-situating their respective meanings, jolting it, in and outside the art (market) is something that is pivotal to every aspect of what we call daily life. 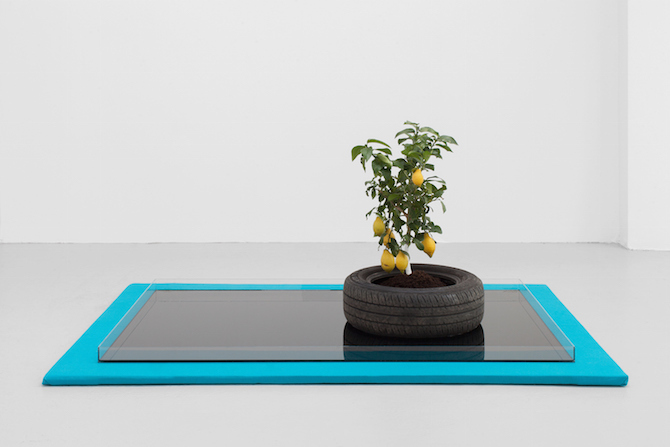 Anna-Lena: While Adrien Missika installed three towers of plants in the gallery space, Lydia Ourahmane embedded a small lemon tree in a car tyre for her installation ‘Land of the Sun’. 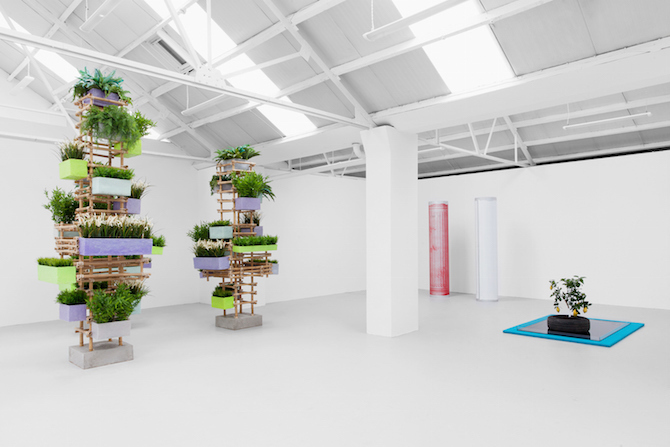 How are plants part of a constructed culture in these two works? 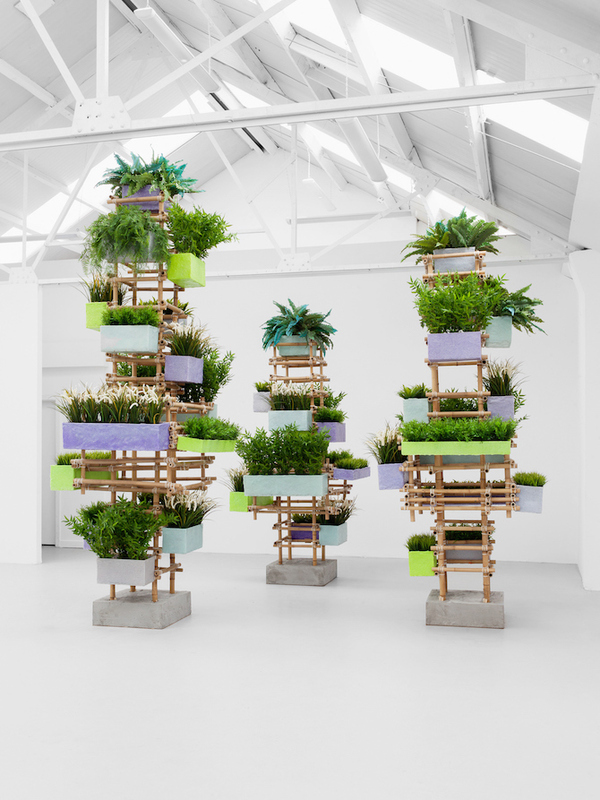 Samuel: Adrien Missika’s installation is made of fake plants bought in IKEA of all places, they had the largest choice available. 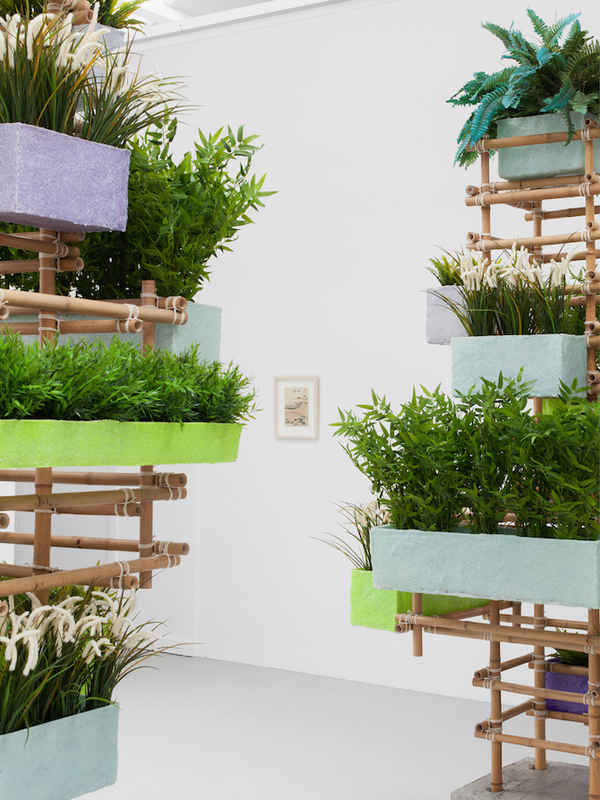 It’s the first time that Missika turned away from real tropical plants and decided to give this Brazilian inspired Utopian structure a real chance at longevity. You don’t have to water them, you see what i mean? But you cannot draw breathe from them either. As for Lydia Ourahmane, the small lemon tree floating, planted in a bit of earth and floating on a rubber try in the midst of engine oil across the Atlantic steers far from its Utopian counterpart, here the plant signifies the promised land for many Algerians fleeing their home country in search for a better life. This, despite the fact that Algeria is one of the oil richest country on the planet. 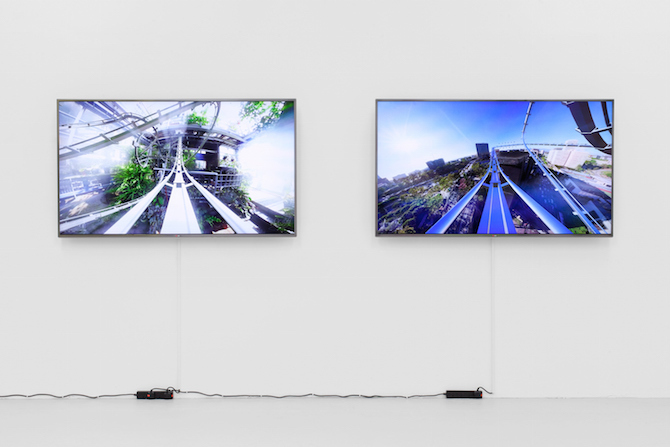 Anna-Lena: Are those two ‘green’ works temporal counter movements against a rapid and digitalised world, as suggested for example in Tabor Robak’s roller coaster work? Samuel: I suppose you could see it as such. Even though the 'fabrication' of Tabor Robaks work – its matrix – took probably much longer to create than its more analogous looking counterparts. We live in a digitalized world so i think you have to look at both works with the same set of eyes. Anna-Lena: In parts, the show suggest aspects of an imaginative dreamily and peaceful world. What responsibility, do you think, do the aesthetics have to express their concerns about current cultural movements? Samuel: The aesthetics carry no responsibilities, their image carries whatever our own cultural construction has taught us to see, depending where you grew up, you will make a different judgement call. Samuel: I just co-curated a small painting show with Fabian Schöneich at Galerie Bernhard in Zurich, its called „Six Possibilities in Painting (Int)“ and looks at figurative painting far from any painterly trends, well besides that figuration is here again, knocking at our door and wanting its time in the limelight. Another exhibition I am presented together with Elise Lammer, co-curator at my space SALTS is of two films by Mathis Gasser, it’s a collaboration with the curatorial class of the Zurich art school ZHDK. 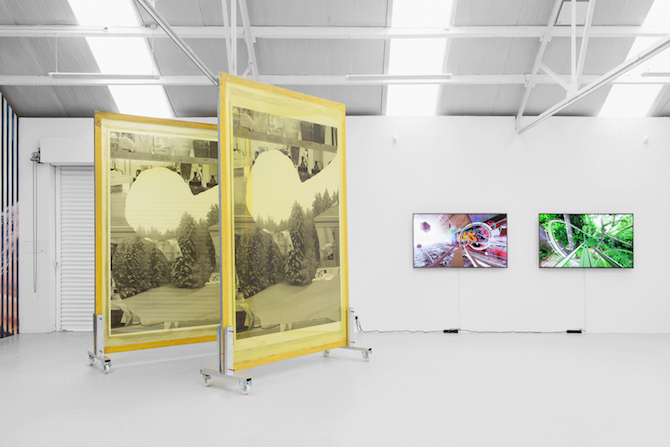 I am also very excited about our two upcoming shows in early April at SALTS, with Venezuelan artist Sol Calero transforming our outdoor space into a Caribbean cabin and while indoors we will present a large-scale installation by PELES EMPIRE, a collective that has been working as an artistic duo as well as running a space with the same name for the last ten years in London. Both shows will be their first in Switzerland.